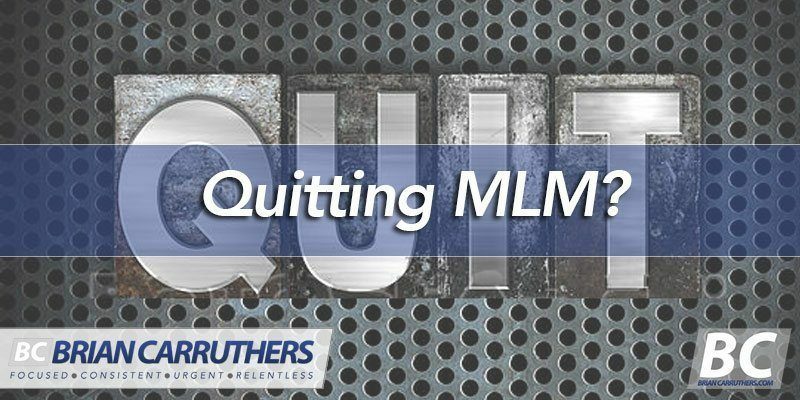 If you’ve been in the business of network marketing for more than 2 days… I know you’ve felt like quitting at least once. Or one hundred times. I sure have. But every time I got close to quitting, I dug deeper. And finally it all clicked, and I built a million dollar a year income. But let’s get back to you quitting. 1. I expected too much. When I saw the presentation, it all looked so simple. You recruit three, they recruit three, then they recruit three, then a few more levels deep and I’d have thousands of team members. If they each just signed up one a week, I will be rich. Well as we know, or maybe you’re learning it now, this doesn’t happen just like that. It takes time to learn, to grow into a leader of people, and to attract enough people to find the studs who will help build a large team that will sell lots of customers (which is what actually generates our income). So many people give up because their expectations were way off. They wanted a get rich quick scheme, and not a real business. You have to be willing to get paid little on the front end for lots of effort, so that you’ll get paid a lot in the long run for effort you no longer have to expend. 2. I expected my sponsor and upline to do a lot more work for me than they were willing. I figured they were going to build a team under me to help me. But I realized that this wasn’t the case. They saw I was a worker and was going to be a strong leg, so they built under other legs. This made me jealous. Nobody ever gave me a single recruit. I felt like of all people, I was working hard enough to deserve some recruits. But here’s the good news… because nobody gave me fish, I had to learn how to fish. Giving me a fish would have fed me for a day, but being forced to learn how to fish has led millions of fish my way. 3. It seemed like nobody I recruited would do anything. They weren’t selling, they weren’t recruiting, they were hardly plugging into events or even getting on team calls. Many wouldn’t even return my calls. Happening to you too?? Well, this will change over time, but only slightly. Most people who start in network marketing won’t do jack squat. They have hardly any skin in the game, they barely believe the business will work, and frankly they don’t much believe in themselves. They don’t believe they have what it takes, or even believe they deserve to succeed. The reason I say this hardly changes is because even after 19 years full time, and after having earned $20M+, I still find this to be true. Even today I have to recruit ten people to find one willing to give any real effort. People say MLM doesn’t work, but that’s malarkey. People don’t work… the business model works great if you work it properly. 4. People quit on me. I invested all that time and energy into them, only to have them quit. Ugh. Buzz kill. When someone quits when they are brand new, they were never really in. But when a leader quits after a year, that’s a hard pill to swallow. This happens, and each time it did, it hurt. I felt like quitting. But I reminded myself of my WHY, and how that person was never even on the radar screen when I began my journey and decided to build this business. So I just manned up and went out and recruited their replacement. I just keep moving forward. 5. The company made decisions I didn’t agree with. So I thought I’d possibly show them by leaving and finding a new business. But then I had to stop myself and remember why I was so passionate about the company’s mission, the product, and the team in the first place. I couldn’t just give up like a baby just because I don’t agree with a decision. Instead I decided to be the force for change, by becoming the top producer and earn the right to have my opinion count with corporate decisions. Where would the world be if Rosa Parks didn’t decide to be the change agent? Or Martin Luther King Jr? I decided not to abandon ship, but rather earn my way into the captain’s chair to steer it. 6. My company was bought and lots of leaders were convinced to leave for other opportunities. Can you imagine how devastating it would be to have major leaders (six-figure earners) who one day decide to roll out and are gone forever? After you’ve invested into them for years, even built teams under them? Trust me, I don’t wish this upon you. I went through it, and I could have left myself and taken a deal. But I chose to stay congruent with my vision and my goals that were embedded in my company, and not abandon ship. I made a commitment, and I was not going to let a tornado send me running. Within time, the storm passed. I gathered up the team who was left and we began to rebuild. And rebuild we did! We are more productive now, earnings per associate are at an all-time high, and the company is setting new records consistently right now. Frankly, I have tremendous self-pride for my determination and I’m so proud of our team. We don’t quit, we don’t scare, we don’t buckle under pressure. We rise up, and we win. 7. The product didn’t work here and there. Yes, nothing is perfect, and I know I’m not either. When the product has a hiccup, it can upset you. But should we throw the baby out with the bath water? When your cell phone drops a couple calls, do you throw it away and go back to using landlines? Or do you switch to another carrier only to find theirs drops calls too? Just think… 25 years ago we had to call people at home and hope to catch them, and if not, we would play tag and wait to connect. Here we are today, complaining when a tower drops an invisible signal being sent through the air from miles away amongst a million other signals! We tend to make mountains out of mole hills. I learned to stop, step back, and just keep things in perspective. Attitude is everything. Little stuff cannot be allowed to knock us off course. 8. I didn’t have time. I was working 60+ hours a week in my current job selling real estate. So I felt like quitting early on because my life was already so consumed with work, and now I’ve got to work even more by adding something else to my plate? When we feel overwhelmed, human nature is to cut things out of our lives to regain sanity. To have “control”. What’s crazy is people start this business to GET time freedom, but then it’s the first thing they cut out… choosing to fall back into the rut of focusing on their current job path that isn’t getting them what they truly want. But it’s what’s familiar. That’s sad. They give up too soon, right when they finally had the answer right there in their hands! I reminded myself of my WHY constantly so I wouldn’t fall victim to this. 9, 10, 11+… I’m sure there are plenty more reasons you can think up to make you feel justified for quitting. It’s because I felt like quitting, and weathered all of the above storms myself, that I am prepared to lead a massive team of people. Everyone will encounter these situations, and if I hadn’t been through the fires myself, how could I know how to lead others through them? Leaders must be fire-tested and proven, if they want thousands of people to believe in and follow them. This is why I am thankful for the difficult times. When people have asked me what I would do differently if I could go back in time, I always say I wouldn’t change a thing. I wouldn’t avoid the hard things. I think above all, I just didn’t want others to see me as a quitter, nor see a quitter/loser when looking in the mirror. I couldn’t live with my family, my kids, seeing me as a quitter. Quitting just shouldn’t be an option. It wasn’t for me. The journey wasn’t easy at all. But man was it all worth it! You can succeed if you just don’t quit and keep moving forward, growing intentionally. Read, train, and prospect daily. You’re on the right path, never doubt it. If you feel other people you know need to hear this message… CLICK THE SOCIAL ICONS ABOVE & SHARE this post. 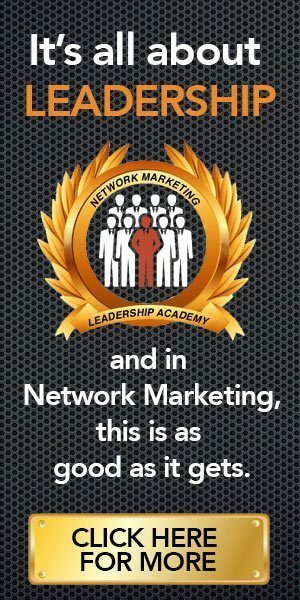 Previous Post THE #1 Thing that Makes or Breaks Network Marketers Next Post You CANNOT miss this!